The following post is intended to offer a brief introduction to the archaeology and early history of Ludford, Lincolnshire, along with some thoughts on its Late Roman and post-Roman significance. Although Ludford is nowadays simply a village on the road from Louth to Market Rasen, sitting atop the Lincolnshire Wolds, in the Late Iron Age, Roman, and possibly early post-Roman eras it appears to have been a site of some considerable significance. The earliest evidence for significant activity at Ludford comes from the Late Iron Age, with a large number of brooches and other items recorded from here on the Portable Antiquities Scheme and elsewhere, including 80 gold, silver and copper-alloy coins, all of which were mostly found just to the east of the current village in fields near to Ludford Grange. 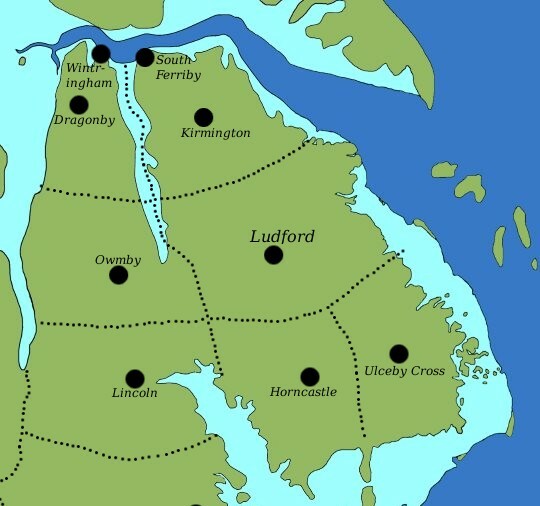 The impressive concentration of Late Iron Age coinage in particular has led Jeffrey May to identify Ludford as one of a small number of major Late Iron Age settlement found spread fairly evenly across the landscape of northern Lincolnshire, each probably controlling a substantial territory 15–20 miles or so across, the suggested extent of which is depicted on the map above. This first phase of occupation at Ludford continued into the early Roman period and was followed by a second, even more intensive phase of occupation in the third and fourth centuries. Extensive finds of Roman pottery, coins, burials, building materials and other artefacts from the area around Ludford Grange and the head of the River Bain indicate that Ludford was probably functioning as a 'small town' in that period and, as such, is likely to have continued to control a significant territory all around it, something supported by the fairly wide and even spacing of such major Roman-era settlements in Lincolnshire (see the map below). These indications of a significant degree of activity at Ludford in the Late Iron Age and Roman eras are reinforced by extensive cropmarks observed in this area by the RCHME and the results of fluxgate gradiometer surveys, which demonstrated that there was intensive activity in several phases at the site even in areas where no cropmarks are now visible. 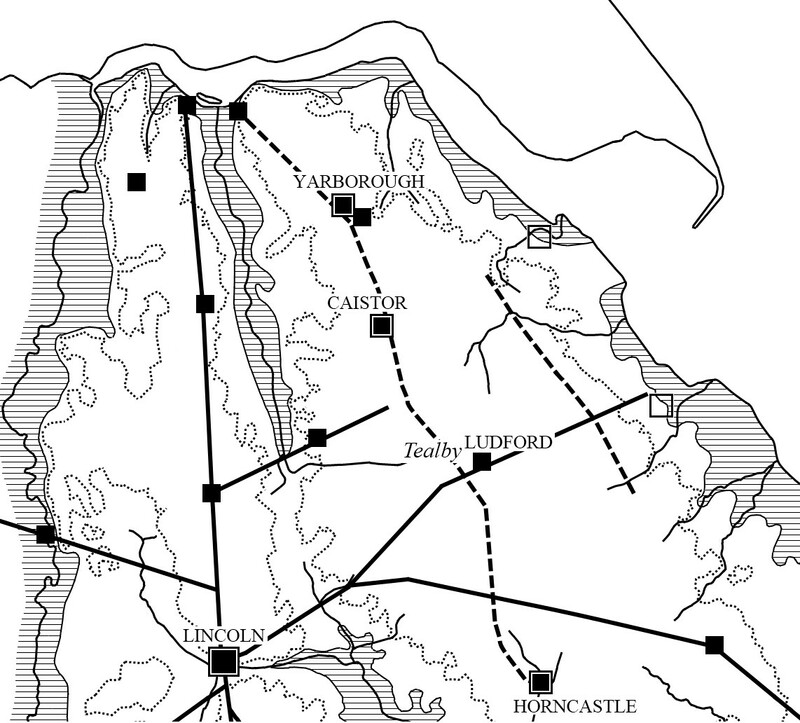 The major settlements and forts of Roman Lincolnshire, set against the probable late/post- Roman landscape and certain major Roman-era routes (image drawn by C. R. Green after Green, 2012, fig. 4, with additions). Note, both Caistor and Horncastle were Late Roman forts with impressive stone walls, and linguistic and historical evidence combine to suggest that there may well have been another Roman walled fort at Skegness that was destroyed by the sea around 500 years ago. Also shown are the locations of three earthen fortifications that are thought to date from the late/post-Roman periods, at Yarborough, Yarburgh and Cun Hu Hill (Grimsby); these are depicted by an 'open square' symbol. A late fourth-century Roman adjustable silver bracelet from Ludford (image: PAS). Another Roman precious-metal item of jewellery from this site is a gold and garnet earring of the second or third century. It is thus clear that Ludford was a locally important settlement and 'central place' within Lincolnshire in both the Late Iron Age and Romano-British eras, and it seems likely that this local importance was maintained into the very late Roman period and potentially a little beyond too. Perhaps the most interesting evidence in this regard comes in the form of a later fourth-century gold coin and three Late Roman spurs that have been found at Ludford 'Roman small town'. Such artefacts have a very similar distribution within the Lincoln region and have been considered indicative of the final stage of official Roman military activity in this region, which was arguably focused on creating a defensive 'ring' around the Late Roman provincial capital and episcopal see of Lincoln, with troops apparently primarily stationed not in the walled forts of the region, but instead at rural strategic sites close to major routeways and/or the coast. Certainly, such a scenario accords well with the fact that the Late Roman field army appears to have been normally billeted in civilian towns rather than assigned to specific military forts, and Ludford was clearly both a civilian 'small town' and a strategic site, being located on top of the Lincolnshire Wolds on a Roman road that ran from the east coast to Lincoln (Margary 272) and also very close to the crossing point of this road with the north–south road linking the Roman walled forts of Caistor and Horncastle (Margary 270). As to who these cavalry troops potentially billeted and losing spurs at Ludford might have been, one reasonable possibility is that they were members of the very late Roman Equites Taifali. This cavalry unit was probably established between 395 and 398 from the Taifali of northern Italy and Gaul and is known to have been in Britain under the command of the Comes Britanniarum ('Count of the Britains') in the very late fourth to early fifth centuries. 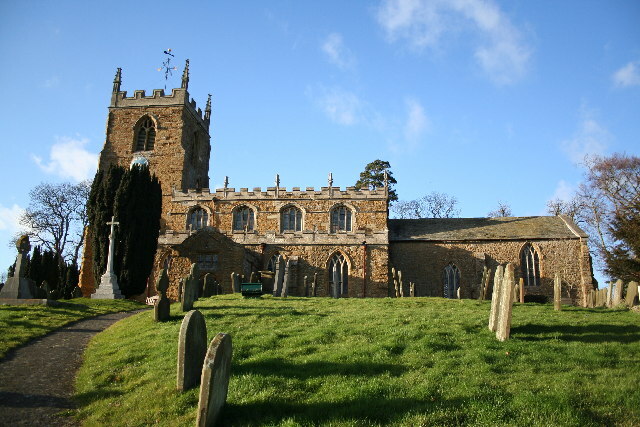 Perhaps most significantly, however, it just so happens that a neighbouring parish to Ludford, Tealby, actually bears an originally Old English name that almost certainly derives from the continental tribal-name Taifali and means '(the settlement of) the Taifali', to which the Old Norse for village, -bȳ, was added in the Anglo-Scandinavian period (Tealby < Tavelesbi/Teflesbi < Old English *Tāflas/*Tǣflas + Old Norse bȳ, with *Tāflas/*Tǣflas being the Old English form of the tribal-name Taifali). Needless to say, such a coincidence is highly suggestive, and it has furthermore been argued that the presence of this tribal-name in Lincolnshire is difficult to explain in a convincing manner without recourse to the Equites Taifali. The location of Tealby in relation to Ludford and key Late Roman sites & routeways; fortified sites are indicated by an open square around a filled square. Image: Green, 2014, fig. 1, with additions; the latter being the two probable earthen fortifications at Yarburgh, near Louth, and Cun Hu Hill, Grimsby, that potentially date from the late/post-Roman period (depicted as open squares). If Ludford at the very end of the fourth century and beginning of the fifth potentially played host to at least elements of the Equites Taifali, what then of it in the post-Roman period? With regard to this, several points can be made. First, the nature of the place-name evidence from neighbouring Tealby is such that, if the name does derive from members of the Equites Taifali (as seems most most likely), then it would require that descendants of former members of the Equites Taifali were still living on the Lincolnshire Wolds in the post-Roman era and retained a separate identity for at least part of that period. This is, needless to say, intriguing in itself, and it is worth noting here that the idea that some members, or former members, of the Equites Taifali might have stayed in this region rather than returning to the continent in the early fifth century could well find an explanation and context in the evidence for the Late Roman provincial capital of Lincoln being able to defend and maintain a significant territory all around itself into the sixth century. In other words, it is possible that the apparent presence of Taifali in the area around Ludford in the post-Roman period resulted from the clear need, apparently successfully met, of those in charge of the provincial capital at Lincoln to employ defenders for their territory as official Roman military activities in Britain drew to a close. Second, there are two deserted medieval villages named East and West Wykeham that lie within Ludford parish and near to the site of the Romano-British town. 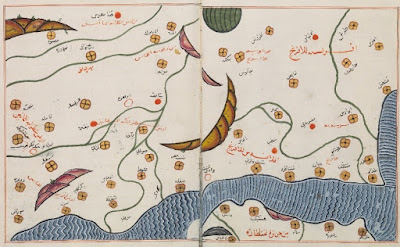 This place-name derives from Old English wīchām, which in turn comes from Latin vicus + Old English hām. Such names are generally considered to derive their Latin first element from their close proximity to a significant Romano-British settlement that was known as a vicus in the Late and post-Roman periods, with vici in this context being probably Romano-British settlements that functioned as local administrative centres, a description which would seem to fit Ludford well. Most important of all, however, is the fact that names in wīchām have often been plausibly considered both to date from the fifth or sixth centuries and to be indicative of some sort of administrative continuity between the Late Roman and 'early Anglo-Saxon' periods, a point of considerable significance in the present context. Taken together, the above points suggest that the Romano-British small town at Ludford and its immediate surrounding area may have continued to be of some local significance into at least the early part of the post-Roman era, that is into the fifth century and perhaps also the sixth. However, when we look beyond this, into the 'Anglo-Saxon' period proper for Lincolnshire, the situation looks somewhat different. For example, Ludford lies not at the heart of one of the recorded Anglo-Scandinavian wapentakes of Lincolnshire, but instead at the junction of three separate wapentakes (Louthesk, Wraggoe, and Walshcroft), suggesting that by the later Anglo-Saxon era any local administrative role and territory for Ludford had been lost and divided. Similarly, whilst the archaeological material recovered from the site of the Romano-British 'small town' and its immediate environs indicates that there was probably a degree of activity hereabouts in the pre-Viking period, there is nothing to really make us think that the site retained any of its earlier importance at that time. The territorial context of the South Elkington-Louth early Anglo-Saxon cremation cemetery. Shown here are the cemetery, the later wapentake boundaries of Louthesk (in grey), relevant place-names, and the suggested extent of a pre-Viking territory focused on the Louth cemetery (image: Green, 2012, fig. 43). 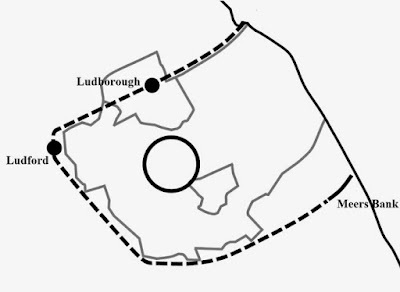 As to both when and why Ludford's apparent Iron Age–early post-Roman local administrative role and territory ended and was divided, this is open to debate. 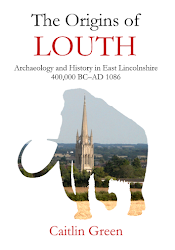 It has been argued that many of Lincolnshire's Anglo-Scandinavian wapentakes had their ultimate origins in the pre-Viking period, and a study of Louthesk wapentake certainly indicates that this wapentake could well have had its roots in a territory associated with the important and massive fifth- to sixth-century cremation cemetery at South Elkington–Louth. This cemetery probably functioned as a funerary, social and sacred 'central place' for the surrounding region in the early Anglo-Saxon period, and was established at a site overlooking the Lincolnshire Marshes and the east coast by 'Anglian' immigrants to the region in the fifth century, who, like the Taifali, were arguably initially used by the post-Roman Britons of Lincoln for the defence of their territory (indeed, they may well have been somehow associated with the possible late/post-Roman coastal fortification at nearby Yarburgh). Furthermore, the Old English place-name 'Ludford' is suggestive too, as not only does it appear to be, in type, a potentially early pre-Viking coinage, but it is also probably best interpreted as meaning 'the ford belonging to Louth', indicating that Ludford had actually come to be under the control of Louth in this period, perhaps lying on the very western edge of its territory. On the basis of the above, it seems likely that the process of Ludford losing at least some of its local centrality and any associated administrative role/territory that had survived into the post-Roman era was already begun by the end of the sixth century. Moreover, it can be suggested that this loss of centrality and division of its probable administrative territory could have been a direct result of the foundation of a new, Anglo-Saxon 'central place' at a strategic site only a few miles to the east of Ludford in the fifth century. 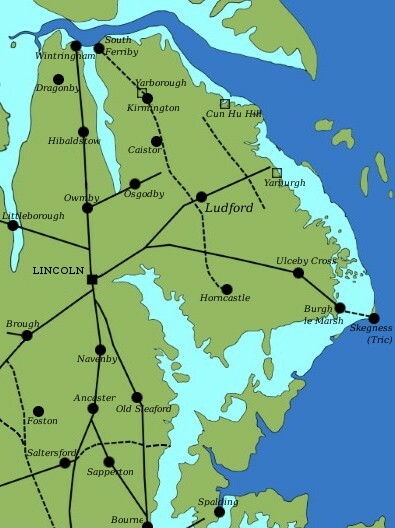 In this light, an acceptable hypothesis that accounts for all of the material discussed above might be that Ludford and its immediate environs retained a degree of local centrality into the fifth and sixth centuries, so long as the Britons were still in at least nominal charge of the Lincoln region. 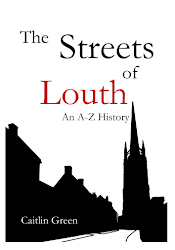 However, when the 'Anglo-Saxon' immigrant groups gained control of the region in the sixth century, Ludford's status and centrality precipitously declined in favour of the immigrants' own, already-established regional centre a few miles to the east at South Elkington–Louth. 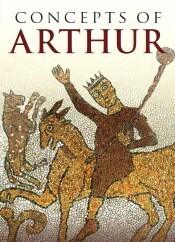 If Ludford itself and the eastern parts of any territory it administered in the late and post- Roman periods may thus have come under the control of the early 'Anglian' immigrant group that was seemingly based a few miles to the east at South Elkington–Louth in the sixth century, what then of the rest of Ludford's 'territory' and, indeed, the Taifali? With regard to this question, it is worth noting that the whole area to the north and west of Ludford lay within the Walshcroft wapentake by the Late Saxon period, with this district including within its bounds not only the modern village of Tealby—'(the settlement of) the Taifali'—but also its neighbouring village of Walesby. Given that there is a case to be made for both the place-name Walesby (DB Walesby) and the wapentake-name Walshcroft (DB Walescros) having derived from Old English Walas, 'the Britons, the Welsh-speakers', it might well be wondered whether Walshcroft wapentake could not have somehow derived from a portion of the territory associated with Ludford that remained, at least nominally, in British/Taifali hands, for a period at any rate? Of course, such a suggestion can only be very tentatively made, but it is an interesting possibility nonetheless. In sum, the archaeology, history and place-names of Ludford and its immediate surroundings suggest that it was of some considerable significance in the past. It was clearly once the site of a major Late Iron Age settlement and Romano-British 'small town' that probably functioned as a local administrative centre for the surrounding region. Furthermore, there is evidence to suggest that at the very end of the Roman era the small town here was home to cavalry troops of the Late Roman military, quite possibly of the Equites Taifali, some of whom may have stayed on in this area to help protect the territory of the former provincial capital of Lincoln into the fifth century, their continued presence arguably underlying the name of a neighbouring parish, Tealby. 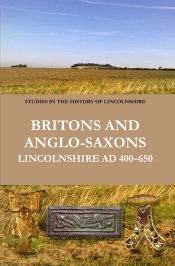 Finally, it can be cautiously argued that Ludford and its immediate environs may have retained a degree of local centrality into the fifth and sixth centuries, but with this perhaps only lasting so long as the Britons were still in at least nominal charge of the Lincoln region. 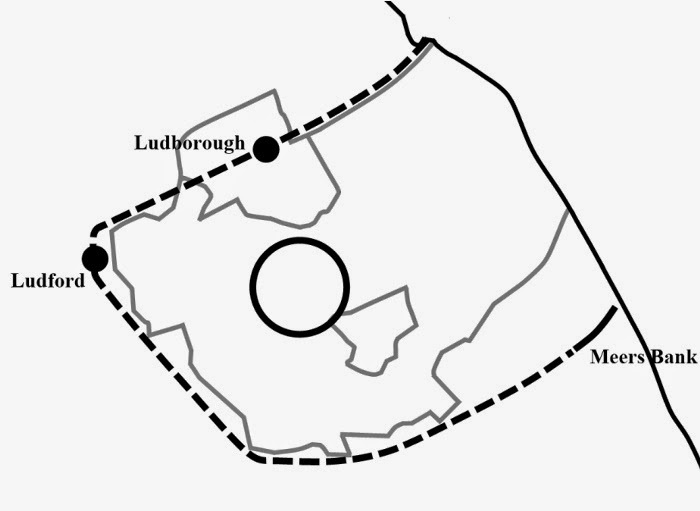 Certainly, it seems likely that Ludford itself had lost its centrality at some point in the early Anglo-Saxon period to the new Anglo-Saxon 'central place' of South Elkington–Louth, a few miles to the east, although it can be tentatively suggested that the later wapentake of Walshcroft could represent a surviving rump of Ludford's territory that remained nominally under British and Taifali control, at least for a time. The content of this post and page, including any original illustrations, is Copyright © Caitlin R. Green, 2015, 2016, All Rights Reserved, and should not be used without permission.